Two years ago I asked you "where are my readers?" Today, I ask you again, where are you? Go sign my Google Maps Guest Map, would you, Dear Reader? It'll just take a moment, no registration required. UPDATE: Read the Guest Map GuestBook directly, without the map. I did a demo site with Google Maps and the GoogleMaps API recently for work. It sure is a nice clean API if you've got the data. I was able to integrate a nice map a day. I'm sure with a weeks work (which I don't have, it's just a demo) one could do some great stuff. You just visit the Google Maps API page and sign up for an API key. You're limited to like a billion views, so don't go over! You can read the API docs as much as I can, so I won't bore you too much, but here's a little of what I did to jumpstart my demo. start="Feb 13 2007 09:00:00 GMT"
end="Feb 16 2007 09:00:00 GMT"
start="Feb 4 2007 10:04:00 GMT-0500"
start="Feb 7 2007 16:00:00 GMT-0500"
title="Jack in the Box $9.44"
I can just add geographic data "along for the ride," made especially easy because this data doesn't have a schema (although I could put it in another namespace). Then add a little script like this to get your XML and yank the data you need. The interesting bits are in red. // or not have a side_bar element. I can't show you the demo I did, because it's super-secret-financial stuff, but perhaps you'll think of a creative new way to include geographic data in the project you're currently working on! I'm a big fan of Google Maps. I built Address Fix with it. I also did a side project where I refreshed the markers if there were any status changes (color of the marker changed). One thing I found was that if you wanted to product a ton of markers, you're better off separating the map from the markers. With about 700 markers, you're already seeing the lag with your map. It's pretty easy to do... you can capture the x/y location of the markers when they add it and save that in your db. Then you can load divs instead all over the map with the markers they chose. It will load in seconds rather than minutes. There are also some other marker tools out there that will 'aggregate' the markers if there in a certain perimeter. When you zoom in, they get more refined. 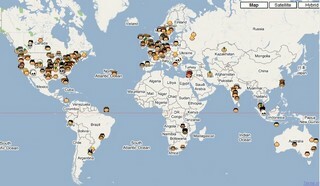 Great, I also have interest like this map guestbook.